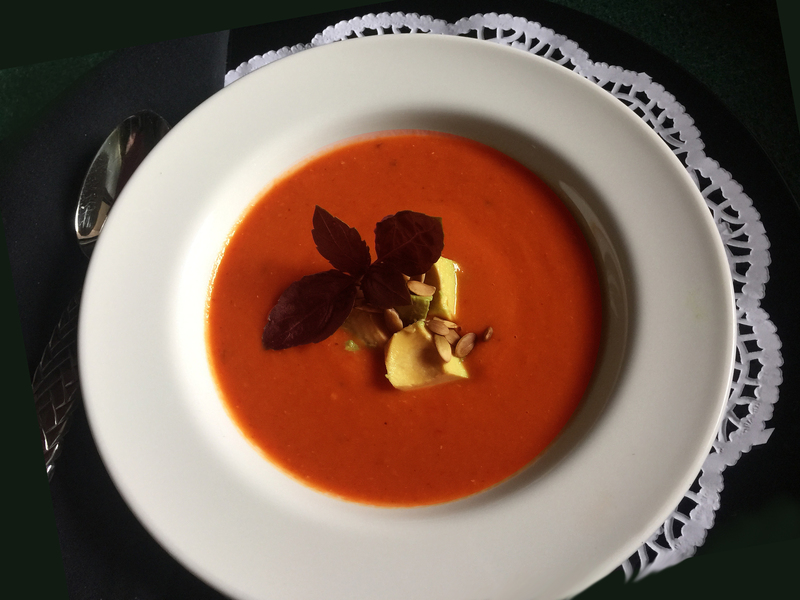 A lovely fresh, sweet tomato and red pepper soup. Red pepper and onion and lots of garlic cloves add immensely to the flavour. 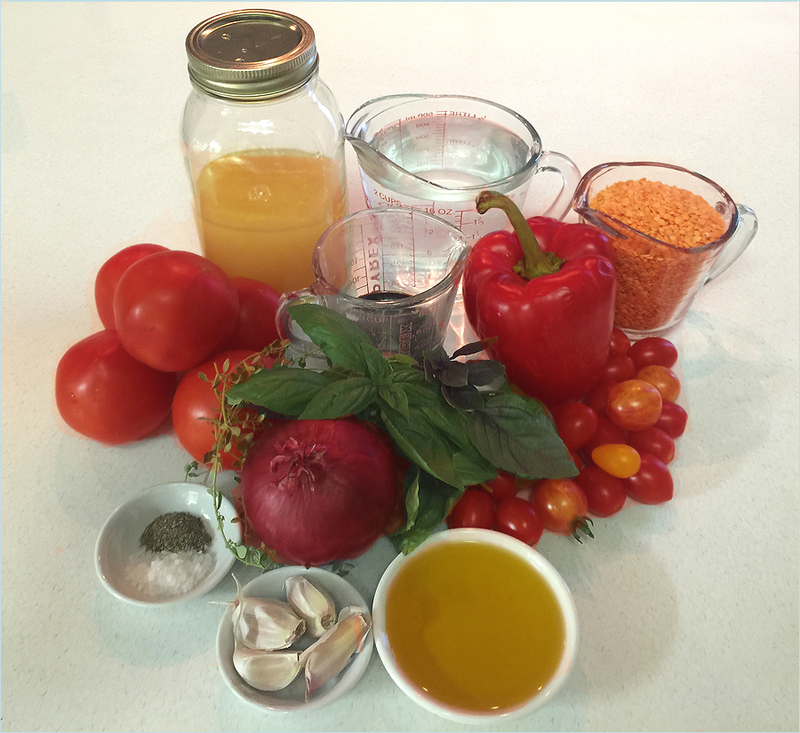 Enjoy the fresh taste of tomato soup in the dead of winter with this freezer friendly Garden Fresh Tomato Soup Recipe. 2) Place the olive oil in a baking dish or a large enameled cast iron soup pot on top of the stove and heat on high. 3) Slice the tomatoes in 1/2 and place cut side down in container to sear the tomatoes. 4) Cut the onions in quarters and place in dish. 5) Quarter and de-seed the red pepper and place in the dish along with the garlic cloves and cherry tomatoes. 6) Sprinkle with salt, pepper, balsamic vinegar. 7) Place in the preheated oven for 20-30 minutes until juices run from the tomatoes. 8) Remove the dish from the oven and transfer to a soup pot if it is not already in one. 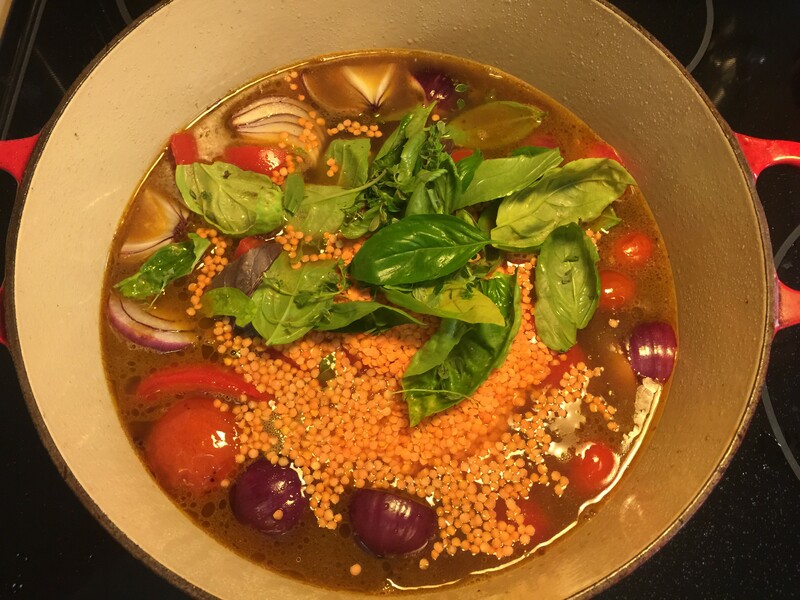 9) Add the lentils, stock, water, thyme, basil and simmer for 30 minutes. 10) Blend the soup in a food processor or blender or with a stick blender. My friends and I like a chunky texture to the soup. I puree part of the soup and combine the rest. After I taste the soup I may add a teaspoon of salt. This will vary each time you make this soup. It depends on the flavour of your ingredients that day. 11) Reheat your finished soup in the pot and serve. You can serve this soup cold on a hot day like a gazpacho in southern Spain. I encourage you to enjoy this versatile freezer friendly soup hot on a cold winter’s day! FOOD TIP: No need to sieve the soup. It’s a waste. Tomato canneries do not take the seeds out, why should you. Use a drizzle of chilli-infused oil at the roasting stage ( Step #7 above). Add a couple of cayenne chillis from your garden, or if you have them on hand. Before freezing your soup, you need to chill the soup. Never put hot food directly into the freezer. To store your soup, I use freezer friendly mason jars. For good Freezer Tips, please click here. If you are taking this soup out from the freezer, you can use it as a base and add additional vegetables, beans or rice – in a pinch, if you are having a lot of guests that day – more than you expected! Such fresh lively taste! Great after working out in the gym. I love all of the fresh ingredients in this! It really does look packed full of flavor. Thank you! It’s a good reminder to eat tasty fresh foods, especially this time of year when everything is so plentiful.. I make tomato soup every year in summer when tomatoes are cheaper and we need something light. Your recipe is definitely splendid as I am beginning to suspect your other recipes will turn out to be when I work my way through your simply splendid blog. In the meantime, can you please point the way to your notes on freezing? I also take advantage of the abundance of tomatoes this time of year. I remembered how good it is to freeze this soup and added the link about 5 minutes ago. Here is the link to my Freezer Tips–>https://simplysplendidfood.com/2015/02/19/freeze-your-soup/ Bon Appétit!